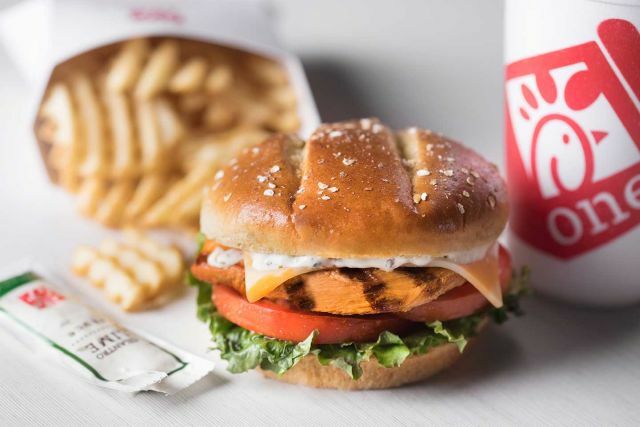 Chick-fil-A looks into expanding the spicy chicken options on the menu with a test of three new spicy options, featuring Spicy Chick-n-Strips and spicy grilled chicken, at participating locations in Phoenix, Yuma, and Tuscon. The second item being tested in the area is the Grilled Spicy Spicy Chicken Deluxe Sandwich, which features grilled chicken marinate in a spicy seasoning, served with Colby-Jack cheese, lettuce, tomato, and new Cilantro Lime Sauce on a new, toasted multi-grain brioche bun. It's new to the Phoenix area but was previously tested in Orlando, St. Louis, and Knoxville. The price on the Grilled Spicy Chicken Deluxe Sandwich starts at $4.95 (may vary). Finally, Chick-fil-A is also testing a new, spicy catering option in Phoenix--the Grilled Spicy Deluxe Bundle. It's basically a build-you-own spicy grilled chicken sandwich package that is meant to serve 10 people (i.e. there's enough ingredients to make 10 sandwiches).